We at St. Paul Catholic High School have a wonderful and thoughtful community of alumni, parents, and friends who, by their generous financial support, have made it possible for us to keep our traditions of academic and extracurricular excellence for over 50 years. Alumni and friends have shown their support of St. Paul Catholic High School of our teams and clubs by supporting their fundraisers. The following is a list of current and upcoming fundraisers to show your support. After Grad is selling "Holy Pierogies"
From March 25, & ending April 8, with delivery on May 3. 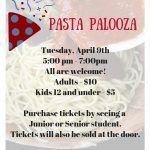 Pasta Palooza - Tuesday April 9th at 5:30pm in the Cafe! Proceeds will help defer prom costs! All are welcome! 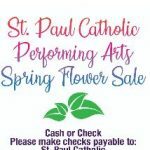 Performing Arts Spring Flower Sale. Download the order form here! Orders must be in by Thursday April 16th and pick up on Thursday May 9th! Please contact Kim Daly at kdaly74@gmail.com for more information OR to order connect with a Performing Arts student! Kids Kicking Cancer for Relay for Life with St. Gregory Church team. April 29 through May 3 the Kids Kicking Cancer will hold a Penny Wars fundraiser between the St. Paul “houses”. Contact Mrs. Stabile if you would like to participate in the Relay for Life!